Chlorine dioxide does not form toxic by-products and is effective over a wide pH range in both hard and soft water. It will eliminate both planktonic and sessile bacteria, disinfect surfaces and rapidly destroy problematic biofilm. 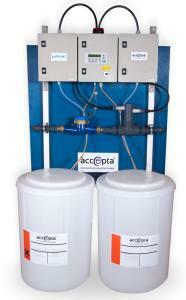 Accepta is a supplier of the Activ-Ox Instant an innovative chlorine dioxide generator that use state-of-the-art technology to safely create carefully controlled amounts of consistently high purity chlorine dioxide ready for use. Accepta’s ClO2 generation systems are ideal for water disinfection and sterilisation applications where safety, reliability, cost and efficiency are all essential. Activ-Ox Instant, like the name suggests produces chlorine dioxide on demand instantly in the water stream being treated to ensure the reaction is safe and highly efficient. Most competitor product cannot come close. To help us with your enquiry please provide as much of the information you have available on the equipment form at the bottom of the product page.